There are many paths to Mastery, but almost all follow the above poem. One would think that this is a common sense approach. However, there exists so many short cuts and promises to make the path quick, easy, and possible for those who lack the fortitude to make mastery a possibility. Most people have the desire to learn/excel/expertise/master a craft, but they do not possess the will. Few will sacrifice for their goals. Few have the patience. Few have the pain tolerance and discipline. No other form of martial arts is more easily, more readily, available to those wanting to circumvent the uphill journey to true mastery than the Filipino martial arts. We lack full time schools offering our arts. Most FMA today is taught by online course, DVD course and through weekend seminars than any other style. Masters of no other style are granting teaching credentials to uncommitted students than the FMA. Few teachers of Arnis and Eskrima are fully dedicated to mastering their arts and therefore teach them as complements to another style. Most teachers have studied full time with a teacher of another style, then achieved their FMA teaching credential through a weekend or semi-annual program–or worse, a distance course. Yes, not everyone lives near a master teaching full time. But not every kid who wanted to be a doctor lives in a city with a Medical school either. Not every kid wanting to be an attorney lives near a Law school. Not every man wants to marry a woman who lives in our city. We choose what we will sacrifice for, but one cannot place low priority on an endeavor and then consider himself equal to those who fully pursued the same goal. Now, on to the subject at hand. One of the biggest flaws in not just the Filipino arts, but in the martial arts in general, is the need to be everything and know everything. This is a debate I engage with frequently. Martial arts teachers are not psychologists. We cannot cure ADD with our fighting styles. We are not marriage counselors. We are not necessarily experts at fitness. Sometimes, we are not experts at all forms of fighting–for example, competition fighting. How often have to seen a traditional martial artist who has never been in the ring, take his students to a full contact competition just to have each one of them lose badly? That teacher knows he is just as green as they are in that arena, but perhaps pride or ego has convinced him that he must portray himself as qualified to lead students into a battle he has never engaged himself? Wouldn’t he honor those students more if he recruited another friend/teacher who could guest teach and assist with his fighters instead? I believe so. Such a teacher who gives his students such a disservice will never be a master in the martial arts. Impatience and modern approaches to the art have convinced today’s teachers that longevity, rank or age qualifies one as a master. I completely disagree. Mediocre young teachers become mediocre old teachers, period. Mastery is based on one’s knowledge, ability, and experience with their chosen craft or profession. If one has studied an art for 30 years, then calls himself a “Master”, what exactly is he claiming to have “Mastered”? “Mastery”, you see, is more of a condition than a person. It is an action word, not a level. Too many organizations have awarded “Mastership” in an art to a man simply because he is well-liked, has longevity or tenure, or has learned a curriculum. This is not mastery. When one has mastered an art, he knows that art better than most people. He knows how to make others master the art. He has looked at that art from all angles, knows its possibilities and limits, and is capable of demonstrating what can be done with the art. We must also look at which part of the art he has truly mastered. Trust me when I say this: 30 years is not a lot of time. I have spoken English for a little over 30 years, and I have not mastered English. I speak it better than my mother and my younger brother. But I cannot give the etymology of words, I frequently mispell words, my knowledge of grammar requires that my articles are edited before we can put them up. I have been speaking English longer than most Grandmasters and masters have studied their arts, and I do so daily, while most martial arts teachers practice only several times a week (if at all)–and I am certainly no master. Hopefully, we have redefined what you might consider mastery with this one paragraph. I have studied in my lifetime close to ten arts. I only claim mastery of three, and I humbly claim such knowing that I have plenty of work and study left. I do not know all aspects of my arts as well. I chose specialties within those three arts, and have left it up to others more knowledgeable and skilled than I am with those things I have not specialized in. Teachers must do the same. I boxed for nearly ten years, but I will not teach a boxing program. I fought in Olympic style Tae Kwon Do tournaments for three seasons as a Black belter, and I dare not offer Olympic style TKD in my school. I have learned more than 40 Kung Fu forms, but I consider myself to have mastered 5. When I claim to have specialized in something, I do so because I had committed myself to full-time study, full-time practice, and full-time introspection of those subjects for years. Not only will I loudly proclaim that I have specialized in these sub-arts within my arts, but I will gladly put my knowledge and ability to the test against anyone. How many of these masters and grandmasters are willing to do the same? 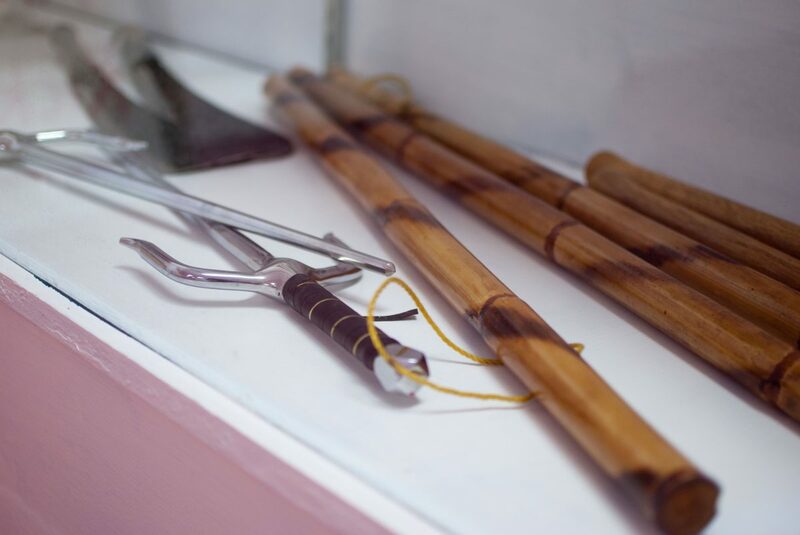 In Eskrima, we have many skills and weapons–although not as many as other styles. I would say that Filipino Eskrimadors overall have mastered the skill of fighting with the stick and fighting with knives. I’ve seen many martial artists and touched hands with many of them–and no one compares to the average Eskrimador. However, with the limited amount of time we in the modern world have to dedicate to our pursuit of training, study, and self-development–you must consider the idea that you cannot master your system’s entire curriculum. Nope, not in one lifetime. Many of you learned in 2 hour classes once or twice a week. Most of you learned in 2-4 hour seminars a few times a year. Most of you practiced casually in informal training groups, and fought competitively once or twice a year. Yet your grandmasters studied every day for perhaps half a day for several years, then fought almost weekly or monthly for several years after that before calling himself a teacher, let alone master. Do you really think your path is equal? Your master put together an art after a lifetime of this art being his full-time study and eventually, his full-time job, yet you have committed yourself to a few seminars a year and one tournament a year to learn it. Surely, at that pace–it would take you several lifetimes to consider yourself equal to the knowledge level your master has achieved. And I couldn’t care less what he puts on your certificate. Yet, you can achieve mastery in the modern world. You can work 40 hours a week or teach another style full time, and master another art part time. (Yes, this does contradict many earlier articles, but hear me out) The key is to specialize in one or two aspects of your systems. Omit things that you do not necessarily have full confidence in, things you don’t like–and instead focus on those things you do like and are actually good at. Give yourself a period of time that you will train with intensity and fanatical commitment, even if you already feel adequate or competent. Because mastery is more than simply knowing or achieving proficiency. Mastery is far beyond “being good” at something; it is closer to perfection and being the best at it. Our arts contain plenty, and unless you have the stomach for it you are unlikely to master it all. Consider specializing at just fighting with the weapon like the Dog Brothers have. Or consider specializing at using the single stick and grappling, as GM Cacoy has done. You don’t have to do and know everything, because as I always say–too many men do everything, but do nothing well. We must not be guilty of being plagued with the mental illness called “Iknowthattoo”. It is a fool’s endeavor, and only novices really believe that you know everything. However, if you specialize in just a few skills and techniques, you will be able to trim the fat and explore everything about your chosen specialty. You will be able to uncover, discover and do things that no other in your field has. And when you have very few peers, you are indeed, a Master. If you enjoyed these or other articles, please share the page, subscribe, and check out my books! Thank you for visiting my blog.